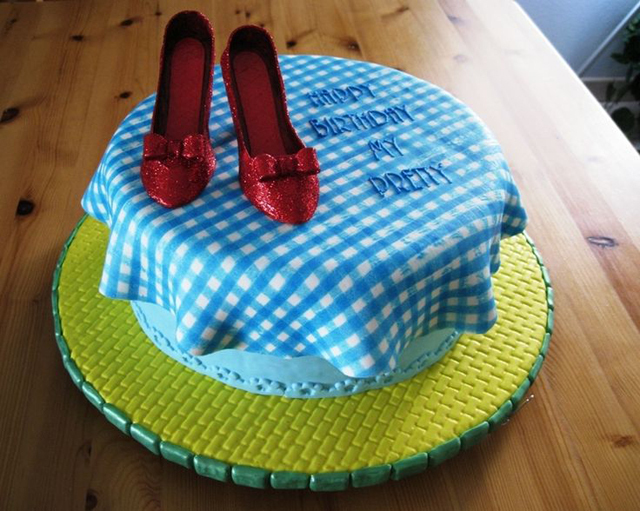 Cake boards are not just the base support of your fabulous creation, although they serve that function as well. So regardless of how you choose to enhance or decorate the board, it is important to make sure it can withstand the weight of your cake and provide enough space around the cake to complete your design. Cake boards can be wood, foam core, thick Styrofoam, plastic, and corrugated cardboard depending on the cake and the weight of the cake. These materials can all benefit from a little decoration and camouflage in order to support the appearance of your cake project. Once you have picked the right material, shape, and thickness for your board, it is time to decide how to cover it. The choice will depend on your finished cake design but there are some options. Make sure your choices are food safe whenever possible such as for contact paper or shrink wrap, and always keep your bottom tier on a cardboard cake board so it doesn't rest directly on the cake board if you are using materials such as paper and fabric. Fondant or marzipan: This can be an expensive choice depending on the size of your board but the smooth finish is absolutely lovely. Fondant can also be tinted, sponge painted, covered in pretty piping and adorned with cut outs. Brush your cake board with gel or cake glue and then roll out your fondant so it is bigger than the board by about 1 inch all the way around. Lay the fondant over the board and use a smoother to create the perfect finish. Carefully cut off the hanging edge and smooth out the rough cut edge with your finger. If you are going to emboss or otherwise imprint the fondant it is best to do so before the fondant dries. Let the fondant dry for a few days before putting your cake on it. Wrapping paper: Yes, you can wrap your cake boards up like presents! It is best to use wrapping paper that has a shiny or moisture resistant finish on it so that the grease and dampness from your cake won't create a mess. Pretend you are wrapping a present and tightly tape the edges of the paper as flat as possible on the underside of the cake board so the top is completely smooth. There are infinite colors, patterns, and textures to wrapping your cake board with this technique. Icing: You can apply a thin or textured layer of icing to your cake board with very little effort or outlay of money. Use royal icing if possible because it will set up firmly and can be enhanced further with color, piping, and texture. Fabric: This is a lovely method to cover your cakes. If you have a wood base you can simply staple the fabric on the bottom of the board and then cover the top with clear contact paper so that the grease from the cake does not cause a stain.